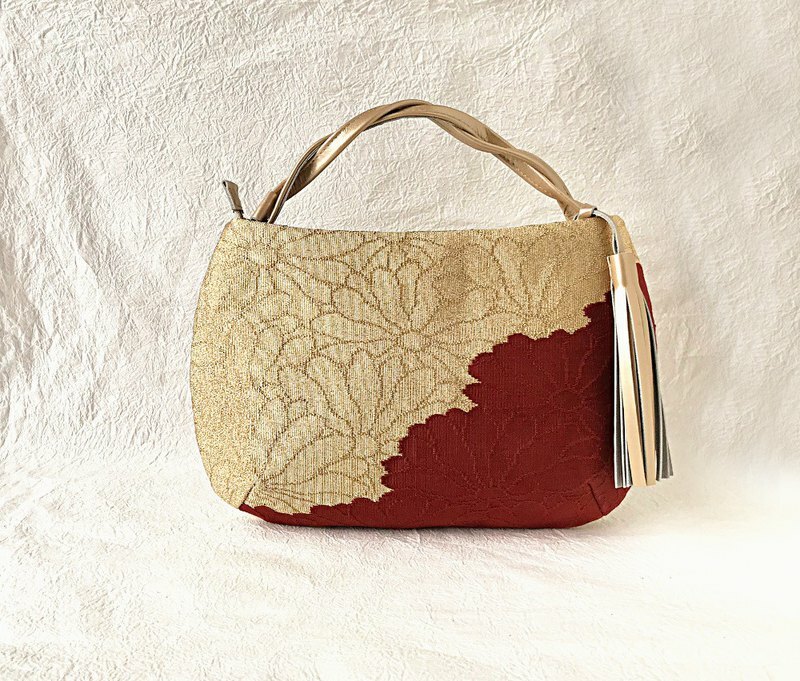 I made remake of the chrysanthemum pattern band woven with gold thread, red brown thread to clutch bag. Chrysanthemum pattern is a kinderisho pattern that has been loved since ancient times as a flower wishing for longevity and longevity. It is a clutch bag with impact of dual color use. You can use it for various occasions from gorgeous seats to everyday. Vertical 19 cm Horizontal bag mouth 24 cm middle 29.0 cm Switching fastener Inner zipper pocket 1, open pocket 1, Handle 25 cm Genuine leather, tassel 12 cm Please allow some errors. It is a band remake item. Although we are producing with extreme care, there may be scratches, dirt etc overlooked points. Please understand beforehand that it is a used item. As we produce everything manually, please understand as each item a slightly different color or shape. Please confirm the "size" and "material" of the work before purchase sufficiently. The color may look different on the screen and the real thing. We also sell them simultaneously at other stores, so please forgive us when out of stock. If you have any questions, please contact us.